One of the best things about stuff from our own childhood coming back around for our kids is that it’s double-time on the fun: We get to relive the nostalgia or our own favorite cartoons and toys (remember the way Strawberry Shortcake dolls smelled? Like plastic and strawberry scented stickers? Still the best smell ever!) while also bonding with the younger generations over characters that they now love! And when it comes to super sweet (geddit?) cartoon characters that both generations can’t get enough of, Strawberry Shortcake is tops! We’ll always wanna get a lil’ bit of the old school version, but we can’t hate the update: While our generation’s cartoons and movies were super colorful adventures about friendship and overcoming obstacles, today’s versions feature some super great lessons about entrepreneurship, individuality, and overall girl power. And we dig it! 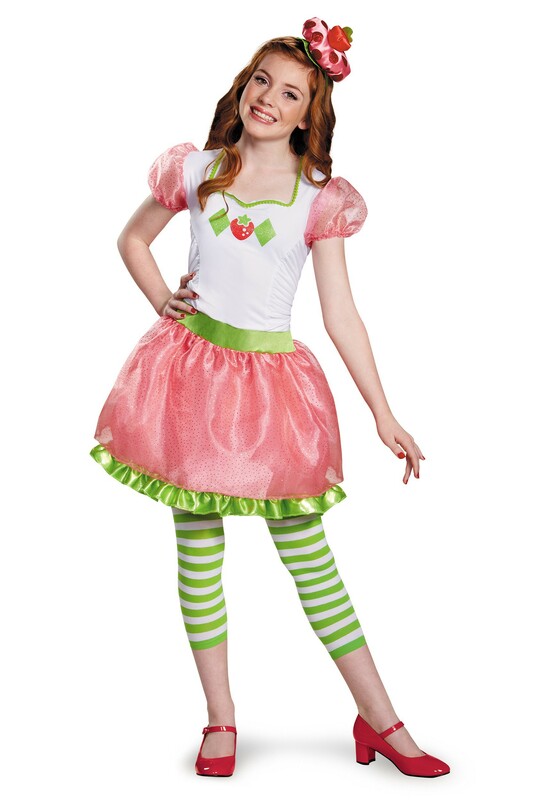 So if your tween is looking for a costume that's a colorful, delectable delight, this Strawberry Shortcake Tween Costume is a sweet idea! She'll be the hostess with the mostest in this officially licensed costume that features puffy sleeves that glitter gorgeously in the light, green and white stretchy striped leggings, and a wide skirt that will remind everyone of their favorite berry! The delightful ensemble even includes a headband with an adjustable mini-hat! Pair it with darling pink or red shoes for a complete look. Better yet, create a truly sweet storyline for this year's Halloween by hosting a tea party where all her friends dress up as Strawberry Shortcake characters!